Drawing from the patterns of simple harmonic motion, (SIN)UOSITY transforms a nondescript overpass into a sculpture that creates both a dramatic pedestrian experience above as well as a landmark to motorists below. Many Atlantans ironically see ‘The Connector’ as a divisive nuisance, but we aim to celebrate this opportunity to stitch together our urban fabric with a dynamic structure which celebrates the vibrancy of this growing city. Curved ribs soar 30 feet overhead to create a grand canopy, embracing the bridge and transforming a once noisy, unpleasant crossing into a unique space that sculpts view sheds to the skylines of both downtown and Atlantic Station. Subtle variations of simple steel and wood ribs create a sinuous surface which elegantly wraps the existing bridge, using minimal intervention to maximum effect. At night the sinuous curves and soaring ribs come alive with strategic lighting which highlights an elegant yet imposing sculpture that celebrates the exciting growth and vibrant future unfolding in Atlanta. One bridge can seem a small intervention into the concrete river of the connector but it is a part of a broader range of efforts to enhance and beautify this city in a way which highlights the best Atlanta has to offer. This bridgescape can symbolize and announce the dynamic atmosphere, the creative energy of the city, to both the millions of annual visitors as well as the locals who are proud to call Atlanta home. 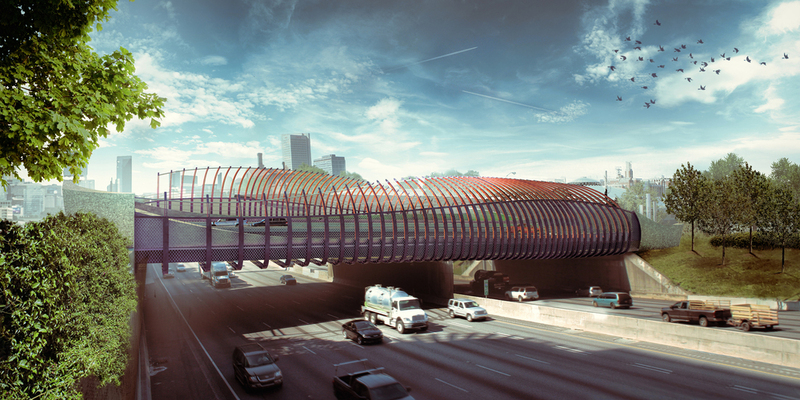 The 10th Street bridge is the winning proposal in the Atlanta Bridgescape Competition. The Atlanta Bridgescape Competition is an urban design challenge seeking creative strategies to enhance existing freeway infrastructure in Midtown and Downtown Atlanta, Georgia. 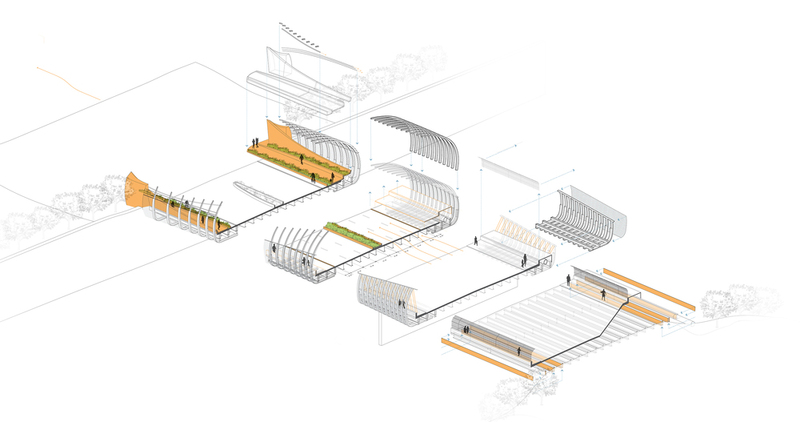 It is a collaborative initiative led by Midtown Alliance, Central Atlanta Progress (CAP)/Atlanta Downtown Improvement District (ADID), the Atlanta Chapter of the American Institute of Architects (AIA) and theArchitecture and Design Center. The competition is part of a larger, phased effort to enhance Interstate75/85, the Atlanta Connector, which traverses five miles through the heart of Atlanta and accommodates over 300,000 vehicles daily. Gateway bridge enhancements are a top priority in this effort due to their high visibility and the potential to positively impact users at a variety of scales. 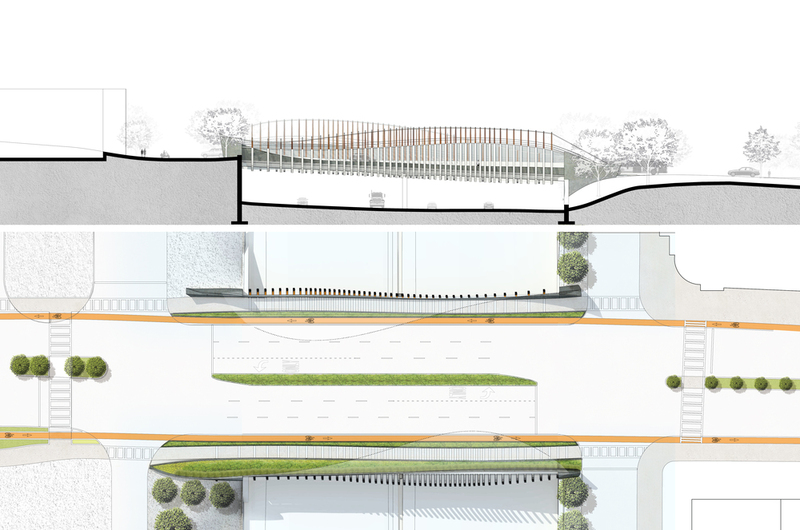 Construction on the first phase of bridge enhancements will begin in 2015 with dramatic arches, lighting, landscaping and signage added to the two Peachtree Street bridges over the Connector.